Good morning, Whatsiterati! For your consideration today, a few videos / links / photo galleries to divert you from your usual Tuesday business. 1. Security-camera video of the tornado hitting the St. Louis airport. 2. Audio clip of the official government announcement to residents in the Chernobyl area, alerting them to the fact that there has been an incident at the nuclear plant and advising them to gather their belongings and leave. This is so eerie, in large part because the woman’s calm delivery is reminiscent of a simple metro announcement. 3. Daniel Kish, blind resident of Long Beach, who “sees” everything around him by use of echolalia, a tongue-clicking technique that helps him hear how far things are from him. He is so adept at it, he is able to ride a bike around in traffic (!). Click here for the story. 4. Aaaaand, finally: A Charlie Chaplin blooper reel. 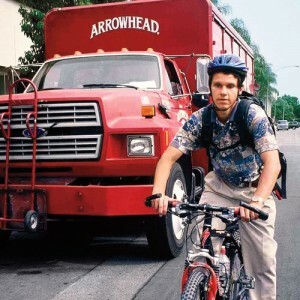 I thought about Daniel Kish today as I rode my bike to work through traffic. It’s totally amazing! Also, I love how the guy on his cell phoneat the beginning of the security camera video isn’t too bothered by the detritus swirling around him in the hallway. He just keeps talking and eventually gets out of the way. Wow, thanks for that footage of my local airport. I had not thought to seek that out. So weird to imagine being there while things are blowing through the main terminal. My favorite was the Chaplin blooper series! It’s hard to tell many of those scenes were bloopers. He’s so magnificently dead pan, and of course, so athletic and gifted with physical humor. I could watch that over and over. In fact, I think I will. Smearcase, try image-googling “Tornado tattoo” – There are some interesting images there, although I think you’re right that tornado art is tricky. When I’m done, how do I stop being a square?